through the Office of Public Affairs on (703) 482-0623. Most Intelligence Community agencies project that before 2015 the United States most likely will face ICBM threats from North Korea and Iran, and possibly from Iraq�barring significant changes in their political orientations�in addition to the longstanding missile forces of Russia and China.� One agency assesses that the United States is unlikely to face an ICBM threat from Iran before 2015. 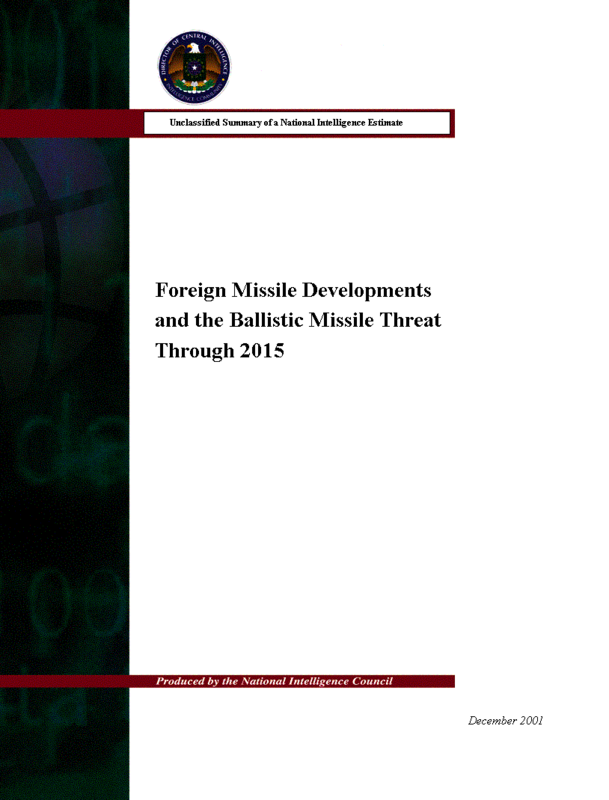 Emerging ballistic missile states continue to increase the range, reliability, and accuracy of the missile systems in their inventories�posing ever greater risks to US forces, interests, and allies throughout the world. China has three new, mobile strategic missiles in development�the road-mobile DF-31 ICBM; the longer range road-mobile DF-31 follow-on; and the JL-2 submarine-launched ballistic missile (SLBM). A Taepo Dong-2 test probably would be conducted in a space launch configuration, like the Taepo Dong-1 test in 1998. Iran is pursuing an ICBM/space launch vehicle (SLV) system.� All agencies agree that Iran could attempt a launch in mid-decade, but Tehran is likely to take until the last half of the decade to flight test an ICBM/SLV; one agency further believes that Iran is unlikely to conduct a successful test until after 2015. If UN prohibitions were eliminated or significantly reduced, Iraq would be likely to spend several years reestablishing its short-range ballistic missile (SRBM) force, developing and deploying solid-propellant systems, and pursuing MRBMs. Foreign nonstate actors�including terrorist, insurgent, or extremist groups that have threatened or have the ability to attack the United States or its interests�have expressed an interest in chemical, biological, radiological, or nuclear (CBRN) materials. 2015, the total number of Chinese strategic warheads will rise several-fold, though it will remain still well below the number of Russian or US forces. North Korea has extended until 2003 the missile launch moratorium it announced late in 1999, although the North continues to work on the Taepo Dong-2 program.� The Taepo Dong-2�capable of reaching parts of the United States with a nuclear weapon-sized payload�may be ready for flight-testing.� The initial test likely would be conducted in a space launch configuration.� Iran also is pursuing a longer range missile capability. North Korea has assumed the role as the missile and manufacturing technology source for many programs.� North Korean willingness to sell complete systems and components has enabled other states to acquire longer range capabilities earlier than otherwise would have been possible�notably the sale of the No Dong MRBM to Pakistan.� The North also has helped countries to acquire technologies to serve as the basis for domestic development efforts�as with Iran�s reverse-engineering of the No Dong in the Shahab-3 program.� Meanwhile, Iran is expanding its efforts to sell missile technology. States with emerging missile programs inevitably will run into problems that will delay and frustrate their desired development timelines.� The impact of these problems increases with the lack of maturity of the program and depends on the level of foreign assistance.� Most emerging missile states are highly dependent on foreign assistance at this stage of their development efforts, and disturbance of the technology and information flow to their programs will have discernible short-term effects.� The ready availability of assistance from multiple sources, however, makes it likely that most emerging missile states will be able to resolve such problems and advance their missile programs, albeit with a slippage in development time. Expertise from inside and outside the Intelligence Community was used to examine many possible options for ICBM development and to determine when a country could test each option, based largely on technical, industrial, and economic capabilities.� These judgments indicate when countries would be capable of testing if they met certain conditions, such as beginning engine testing by a certain date.� This formulation also addresses what a country may be capable of achieving if a decision were made to try to field a missile as rapidly as possible and if the program progressed without significant delays.� Other factors�including potential technical problems, motivations and intentions, and political and economic delays�then were applied to assess the likely timing of the country testing an ICBM.� These judgments provide the Intelligence Community assessments of the most likely course of events based on a variety of factors. Providing assessments of when a country could and is likely to test an ICBM takes into account uncertainties and cases where a solid evidentiary base is not available for making more definitive assessments.� The availability of foreign assistance is frequently a critical driver in both formulations, and is so noted, especially when foreign assistance accelerates the program dramatically.� These assessments of future missile developments are, by their nature, subjective. �This Estimate examines the level of success and the pace individual countries have experienced in their missile development efforts and considers foreign technology transfers, political motivations, military incentives, and economic resources.� But it does not attempt to address all of the potential political, economic, and social changes that could occur; it projects missile developments between now and 2015 independent of significant political and economic changes.� As each annual report is prepared, we review strategic trends that could indicate such changes and make necessary adjustments to the projections. Some of the states armed with missiles have exhibited a willingness to use chemical weapons with other delivery means.� In addition, some nonstate entities are seeking chemical, biological, radiological, and nuclear (CBRN) materials and would be willing to use them without missiles.� In fact, US territory is more likely to be attacked with these materials from nonmissile delivery means�most likely from terrorists�than by missiles, primarily because nonmissile delivery means are less costly, easier to acquire, and more reliable and accurate.� They also can be used without attribution.� Nevertheless, the missile threat will continue to grow, in part because missiles have become important regional weapons in the arsenals of numerous countries.� Moreover, missiles provide a level of prestige, coercive diplomacy, and deterrence that nonmissile means do not. Russia currently has about 700 ICBMs with 3,000 warheads and a dozen SSBNs equipped with 200 launchers for SLBMs that can carry 900 warheads. In the current day-to-day operational environment�with all procedural and technical safeguards in place�an unauthorized or accidental launch of a Russian strategic missile is highly unlikely. Concerns over the US Missile Defense (MD) program have led several high-ranking Russian political, military, and industry officials to openly discuss military countermeasures to the system.� The SS-27�developed in the 1980s as a response to the Strategic Defense Initiative�probably is the basis for Russia�s most credible responses to MD. DF-31), which is now in the flight-test stage; a longer range version of the DF-31; and the JL-2 SLBM.� This modernization effort, which dates from the mid-1980s, forms the foundation of Beijing�s efforts to field a modern, mobile, and more survivable strategic missile force. Beijing could begin deploying the DF-31 follow-on ICBM and JL-2 SLBM in the last half of the decade. China maintains a robust CSS-5 MRBM force and continues to increase the capabilities of its SRBM force deployed opposite Taiwan. �North Korea has hundreds of Scuds and No Dong missiles and continues to develop the longer range Taepo Dong-2, which will enable the North to target the United States.� In May 2001, however, Kim Chong-il unilaterally extended the North�s voluntary flight-test moratorium�in effect since 1999�until 2003, provided negotiations with the United States proceeded. Taepo Dong-2.� The multiple-stage Taepo Dong-2�capable of reaching parts of the United States with a nuclear weapon-sized payload�may be ready for flight-testing.� The North probably also is working on improvements to its current design. The Intelligence Community judged in the mid-1990s that North Korea had produced one, possibly two, nuclear weapons, although the North has frozen plutonium production activities at Yongbyon in accordance with the Agreed Framework of 1994.� North Korea also has chemical and biological weapons programs. Iran�s missile inventory is among the largest in the Middle East and includes some 1,300-km-range Shahab-3 MRBMs, a few hundred SRBMs, and a variety of unguided rockets.� Tehran�s longstanding commitment to its ballistic missile programs�for deterrence and war-fighting�is unlikely to diminish. All agencies agree that Iran could attempt to launch an ICBM/SLV about mid-decade, although most agencies believe Iran is likely to take until the last half of the decade to do so.� One agency further judges that Iran is unlikely to achieve a successful test of an ICBM before 2015. Iranian acquisition of complete systems or major subsystems�such as North Korean TD-2 or Russian engines�could accelerate its capability to flight-test an ICBM/SLV. If Iran were to acquire complete TD-2 systems from North Korea, it could conduct a flight test within a year of delivery, allowing time to construct a launch facility.� Iran is unlikely to acquire complete ICBM/SLV systems from Russia. Baghdad�s goal of becoming the predominant regional power and its hostile relations with many of its neighbors are the key drivers behind Iraq�s ballistic missile program.� Iraq has been able to maintain the infrastructure and expertise necessary to develop missiles, and the IC believes it has retained a small, covert force of Scud-type missiles, launchers, and Scud-specific production equipment and support apparatus.� For the next several years at least, Iraq�s ballistic missile initiatives probably will focus on reconstituting its pre-Gulf war capabilities to threaten regional targets and probably will not advance beyond MRBM systems. A military parade in December 2000 showcased Al Samoud missiles on new transporter-erector-launchers (TELs).� The liquid-propellant Al-Samoud SRBM probably will be deployed soon. With substantial foreign assistance, Baghdad could flight-test a domestic MRBM by mid-decade.� This possibility presumes rapid erosion of UN prohibitions and Baghdad's willingness to risk detection of developmental steps, such as static engine testing, earlier.� An MRBM flight test is likely by 2010.� An imported MRBM could be flight-tested within months of acquisition. If Iraq could buy a TD-2 from North Korea, it could have a launch capability within a year or two of a purchase. It could develop and test a TD-1-type system within a few years. If it acquired No Dongs from North Korea, it could test an ICBM within a few years of acquisition by clustering and staging the No Dongs�similar to the clustering of Scuds for the Al Abid SLV. If Iraq bought TD-2 engines, it could test an ICBM within about five years of the acquisition. Baghdad had a crash program to develop a nuclear weapon for missile delivery in 1990, but coalition bombing and IAEA and UNSCOM activities significantly set back the effort.� The Intelligence Community estimates that Iraq, unconstrained, would take several years to produce enough fissile material to make a weapon.� Iraq has admitted to having biological and chemical weapons programs before the Gulf war and maintains those programs. Foreign assistance is key to Iraqi efforts to develop quickly longer range missiles.� Iraq relied on extensive foreign assistance before the Gulf war and will continue to seek foreign assistance to expand its current capabilities. Syrian regional concerns may lead Damascus to seek a longer range ballistic missile capability such as North Korea�s No Dong MRBM.� The IC judges that Syria does not now have and is unlikely to gain an interest in an ICBM capability during the time frame of this Estimate. Foreign assistance is critical to Syrian efforts to improve its production capabilities and to gain access to export-controlled components and technology. New Delhi believes that a nuclear-capable missile delivery option is necessary to deter Pakistani first use of nuclear weapons and thereby preserve the option to wage limited conventional war in response to Pakistani provocations in Kashmir or elsewhere.� Nuclear weapons also serve as a hedge against a confrontation with China.� New Delhi views the development, not just the possession, of nuclear-capable ballistic missiles as the symbols of a world power and an important component of self-reliance. Growing experience and an expanding infrastructure are providing India the means to accelerate both development and production of new systems.� New Delhi is making progress toward its aim of achieving self-sufficiency for its missile programs, but it continues to rely on foreign assistance. Converting the Indian SLV into an ICBM? Rumors persist concerning Indian plans for an ICBM program, referred to in open sources as the Surya.� Some Indian defense writers argue that possession of an ICBM is a key symbol in India�s quest for recognition as a world power and useful in preventing diplomatic bullying by the United States.� Most components needed for an ICBM are available from India�s indigenous space program.� India could convert its polar space launch vehicle into an ICBM within a year or two of a decision to do so. The 150-km-range Prithvi I SRBM continues to be India�s only deployed ballistic missile. The Prithvi II SRBM is a modified Prithvi I with an increased range of 250 km. Ghauri/No Dong MRBMs that Pakistan acquired from North Korea. The Shaheen I, a Pakistani-produced single-stage, solid-propellant SRBM. Several countries are technically capable of developing a missile launch mechanism to use from forward-based ships or other platforms to launch SRBMs and MRBMs, or land-attack cruise missiles (LACMs) against the United States.� Some of these are likely to develop and deploy forward-based systems�more likely cruise missiles�during the period of this Estimate.� Nevertheless, long-distance strikes against the United States probably would be operationally difficult.� Other methods would be less complicated�CBRN terrorism, for example. From a technical standpoint, cruise missiles are a better alternative than ballistic missiles in launching from forward areas.� Many countries would therefore see these missiles as advantageous in attacking the United States.� The most plausible alternative for a forward-based launch would be a covertly equipped commercial vessel. Are less expensive than developing and producing ICBMs. Can be covertly developed and employed; the source of the weapon could be masked in an attempt to evade retaliation. Probably would be more reliable than ICBMs that have not completed rigorous testing and validation programs. Probably would be much more accurate than emerging ICBMs over the next 15 years. Probably would be more effective for disseminating biological warfare agent than a ballistic missile. SSBN is the acronym for nuclear-powered ballistic missile submarine. Multiple reentry vehicle payload systems include those that independently target each RV in the system (MIRVs) and those that do not provide independent targeting for each RV (MRV).